EUGENE, Ore. – Nov. 15, 2017 — The Colorado River's initial trip to the ocean didn't come easy, but its story has emerged from layers of sediment preserved within tectonically active stretches of the waterway's lower reaches. A scientific team, led by geologist Rebecca Dorsey of the University of Oregon, theorizes that the river's route off the Colorado Plateau was influenced by a combination of tectonic deformation and changing sea levels that produced a series of stops and starts between roughly 6.3 and 4.8 million years ago. Dorsey's team lays out its case in an invited-research paper in the journal Sedimentary Geology. The team's interpretation challenges long-held conventional thinking that once a river connects to the ocean it's a done deal. "The birth of the Colorado River was more punctuated and filled with more uneven behavior than we expected," Dorsey said. "We've been trying to figure this out for years. This study is a major synthesis of regional stratigraphy, sedimentology and micropaleontology. By integrating these different datasets we are able to identify the different processes that controlled the birth and early evolution of this iconic river system." The region covered in the research stretches from the southern Bouse Formation, near present-day Blythe, California, to the western Salton Trough north of where the river now trickles into the Gulf of California. The Bouse Formation and deposits in the Salton Trough have similar ages and span both sides of the San Andreas Fault, providing important clues to the river's origins. 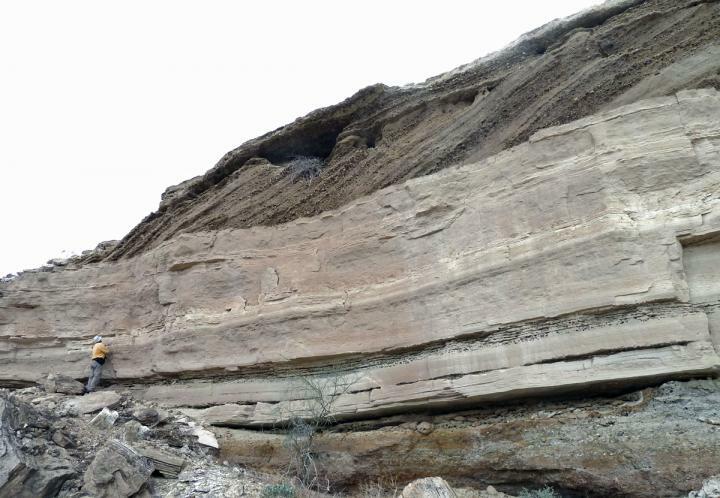 Last year, in the journal Geology, a project led by graduate student Brennan O'Connell, a co-author on the new study, concluded that laminated sediments found in exposed rock along the river near Blythe were deposited by tidal currents 5.5 million years ago. The Gulf of California, it was argued, extended into the region, but the age of the deposits and tectonic and sea level changes at work during that time were not well understood. Analyses by Kristin McDougall, a micropaleontologist with the U.S. Geological Survey and co-author on the new paper, helped the team better pinpoint the timing of the limestone deposits to about 6 million years ago, when tiny marine organisms lived in the water and were deposited at the same time. About 5.4 million years ago, conditions changed. Global sea level was falling but instead of bay water levels declining, as would be expected, the water depth increased due to tectonic subsidence of the crust, the researchers discovered. The basal carbonate material left by marine organisms was then inundated by fresh water as the river swept down into lower elevations, bringing with it clay and sand from mountain terrain, they found. "The bay filled up with river sediment as the sediment migrated toward the ocean," Dorsey said. "As more sediment came in, transport processes caused the delta front to move down the valley, transforming the marine bay into a delta and then the earliest through-flowing Colorado River." The river had arrived in the gulf, but only temporarily. A tug-of-war lasting for 200,000 to 300,000 years began some 5.1 million years ago, when the river stopped delivering sediments from upstream. The delta retreated and seawater returned to the lower Colorado River valley for a short time. The evidence is in the stratigraphy and fossils. Researchers found that clay and sand from the river became mixed with and then covered by marine sediment. Something, Dorsey said, apparently was happening upstream, trapping river sediment. A good bet, the researchers think, is tectonic activity, perhaps earthquakes along a fault zone in the river's northern basin that created subsidence in the riverbed or deep lakes along the river's path. At roughly 4.8 million years ago, the river resumed depositing massive amounts of sediment back into the Salton Trough and began rebuilding the delta. Today's view of the delta, however, reflects human-made modern disturbances to the river's sediment discharge and flow of water reaching the gulf. To meet agricultural demands for irrigation and drinking water for human consumption, Hoover Dam was constructed on the river to form Lake Mead during the 1930s. In 1956-1966, Glen Canyon Dam was built, forming Lake Powell. "If we could go back to 1900 before the dams that trap the sediment and water, we would see that the delta area was full of channels, islands, sand bars and moving sediment. It was a very diverse, dynamic and rich delta system. But manmade dams are trapping sediment today, eerily similar to what happened roughly 5 million years ago," Dorsey said. The bottom line of the research, she said, is that no single process controlled the Colorado River's initial route to the sea. "Different processes interacted in a surprisingly complicated sequence of events that led to the final integration of that river out to the ocean," she said. The research, Dorsey said, provides insights that help scientists understand how such systems change through time. The Colorado River is an excellent natural laboratory, she said, because sedimentary deposits that formed prior to and during river initiation are well exposed throughout the lower river valley. "This research," Dorsey said, "is very relevant to today because we have global sea level rising, climate is warming, coastlines are being inundated and submerged, and the supply of river sediment exerts a critical control on the fate of deltas where they meet the ocean. Documenting the complex interaction of these processes in the past helps us understand what is happening today." Mindy B. Homan, a former UO doctoral student and now a geologist with Devon Energy in Wyoming, was a co-author on the study. The National Science Foundation (grant EAR-1546006), Society for Sedimentary Geology and Geological Society of America supported the research.